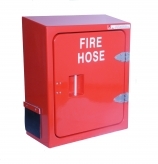 Jo Bird is recognised internationally as one of the world's leading designers and manufacturers of storage cabinets for fire fighting, fire safety, lifesaving and emergency equipment for use in physically demanding locations from offshore and marine applications to onshore industrial uses. Jo Bird is unique amongst UK manufacturers in having Lloyds Type Test Approval for many of its products. Jo Bird’s quality assurance standards are demonstrated through certification to BS EN: ISO: 9001/2000. The extensive Firebird range of products are all made to order allowing Jo Bird to offer a variety of colours, lettering and internal fittings including shelves, hang rails, insulation and heaters.